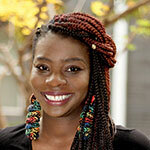 Marie Casimir is a Haitian American performer, writer, producer, and lecturer of African and African diaspora dance in the Clara Luper African & African American Studies Department at OU. She is the founder and director of Djaspora Productions, supporting and producing art that connects artists of color locally and globally. She is a co-founder and producer of the Instigation Festival, a dance and music festival in Chicago and New Orleans. A 2018 Ragdale Artists Fellow and recipient of a OneLove Nola Residency, she has served as an arts and culture consultant for the Consulate of Haiti in Chicago and associate director of Links Hall in Chicago.